OS X and Linux versions are currently suffering from frequent crashes on high graphics settings. Default installation requires Steam (see Play without Steam). Russian copies use StarForce 5 DRM. CIS/Russian retail can be activated on GOG.com. Optional Steam unlock. Can be bundled with Napoleonic Wars. Can be played without Steam using the CD key link in the client. All versions except GOG.com require one-time activation. Each serial key can activate M&B twice in a 60-day period. The game may need to be re-authenticated if your computer hardware changes. If the game is not authenticated it will play in demo mode with game time limited to 30 game days. If the computer with the game does not have internet access, M&B can be manually authenticated. The latest patch is Version 1.172. Online play requires using the latest version. The Steam version already has this patch. This only works for the Windows version. Download and install the full installer. Go to Warband in the Library. Click CD Key on the sidebar to the right. Run the non-Steam Warband you installed and click Activate when prompted. Enter the key from Steam. Extract mods to the Modules folder, then select the mod from the drop down menu in the launcher. To increase the limit of how many troops can be on screen at once, download. Battle Size Changer. It increases the limit to anywhere from 150 to 1000. It is best to stay below 300, as higher values may cause performance issues. 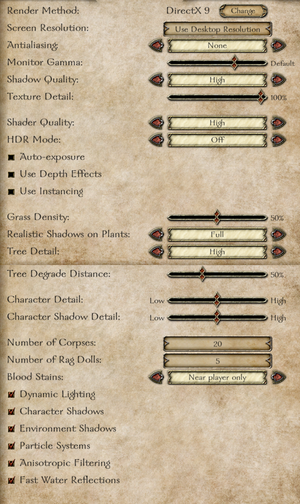 Floris Modpack is a comprehensive modpack containing lots of mods which improve the game in almost every way. 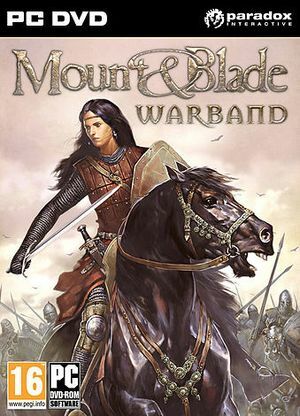 Product keys are stored in HKEY_CURRENT_USER\Software\MountAndBladeWarbandKeys on Windows. UI is stretched to fill the screen. See Borderless fullscreen windowed hide menus for best effects. Set in launcher (enabled by default). 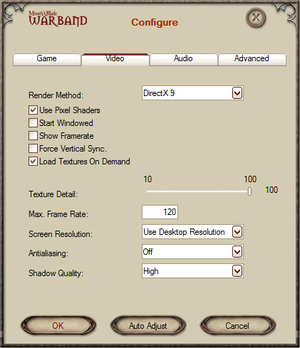 Frame rate cap is fully configurable. Cannot be disabled in-game; see Haptic feedback. Language is set in Launcher (Configure, Game). Servers can optionally use Valve Anti-Cheat (VAC) protection. Use the Dedicated Server Files. On the "Video" tab, check "Load Textures on Demand"
Additionally, you might want to decrease texture detail if your problem is not fixed. This page was last edited on 18 April 2019, at 08:28.